Sony’s been fleshing out their full frame FE lens lineup for E-Mount fairly quickly over the past year and a half, as the total FE system is now up to 11 native AF lenses. One of the newest lenses to hit the street is aimed squarely at the professional and enthusiast with the no-compromises Zeiss 35mm f/1.4 Distagon. In stark contrast to the slower and significantly smaller Zeiss 35mm f/2.8 Sonnar, released at the launch of the FE line, the 35mm f/1.4 is a huge lens with a large aperture, and promises top-flight image quality. With a $1,600 US price tag to go along with the large size, the lens will need to be an optical gem to be worth the price, size and weight penalties. Let’s see if it meets the mark. The Zeiss FE 35mm f/1.4 is a robust fast wide-angle lens that looks more like a telephoto lens than a mirrorless wide-angle. 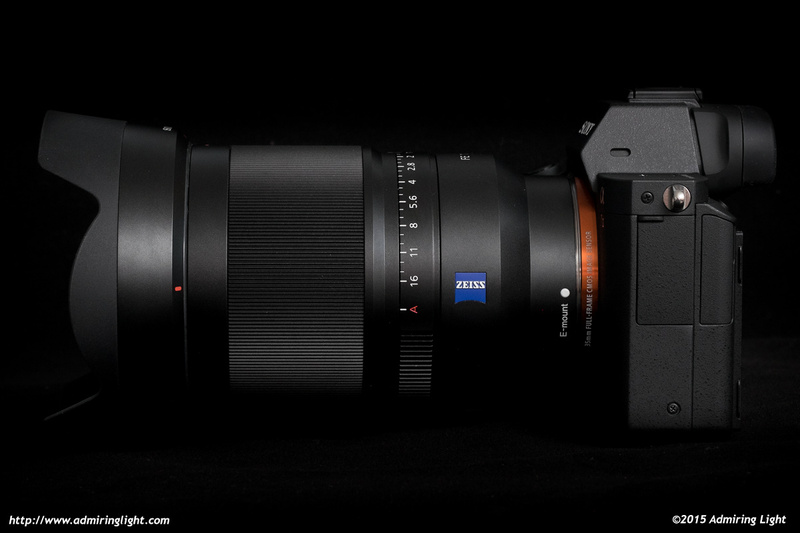 Sony and Zeiss have thrown any pretense of size reduction out the window with this optic, and have instead focused on premium build and premium image quality. The lens certainly lives up to expectations with regards to construction. 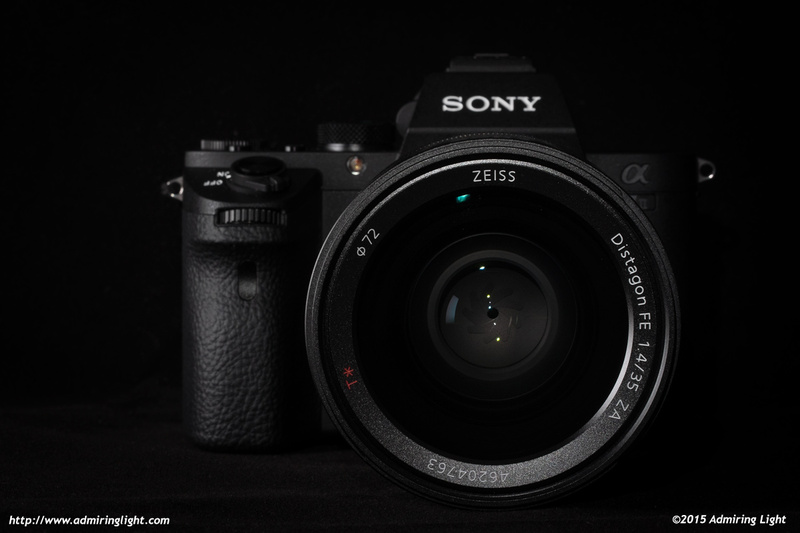 The Zeiss 35mm f/1.4 is a large, moderately heavy lens with a solid all metal exterior construction. The lens is very tightly assembled with a flawlessly finished matte black metal lens barrel and a wide ribbed focus ring for easy manual focus. The focus ring is well damped and silky smooth to operate. The lens includes a metal and plastic lens hood, which adds another two inches to the length. 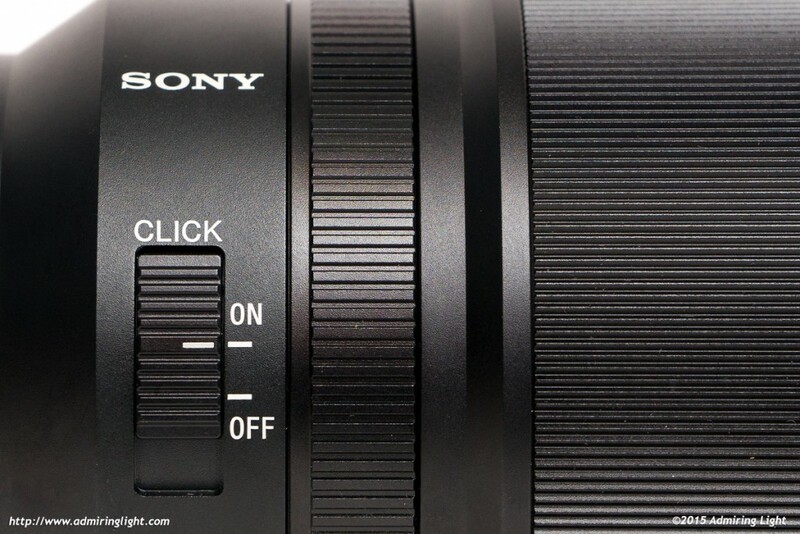 The lens is unique in the Sony world, being one of only two native lenses for E-Mount with an aperture ring. The relatively wide aperture ring features 1/3 stop detents that are individually marked. Damping on the aperture ring is almost perfect. It’s stiff enough to avoid accidental aperture changes, but not too tight to make changing the aperture difficult. In a very nice nod to video shooters, the FE 35mm f/1.4 includes a switch to remove the detents for the aperture ring, allowing the aperture to be changed smoothly and silently. The only real issue I had with the aperture ring is the area marked with f-stops and hash marks does not have any ribbing on it, which can make it hard to grip with the left hand in some positions. In my introduction, I’ve mentioned the size of this lens several times, and for good reason. Optical quality can sometimes come with a size penalty, and such is the case here. The lens is larger than many 35mm f/1.4 lenses for DSLRs and significantly larger than its slower sibling, the FE 35mm f/2.8 Sonnar. Of course, with an aperture two stops faster, you’d expect a notable size increase. In this case, the increase is triple the length and over five times the weight. That’s right, five times heavier. 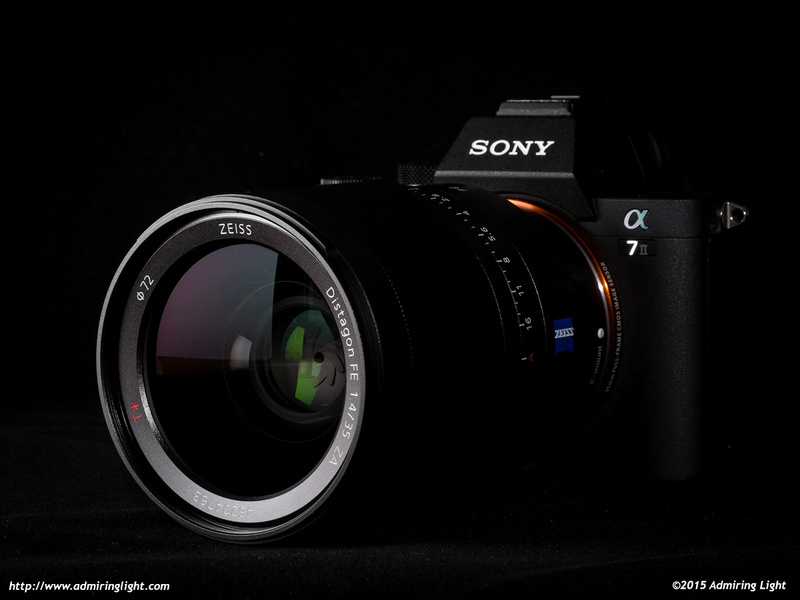 When the lens is mounted on a body like the A7 II, the overall package is anything but discreet. 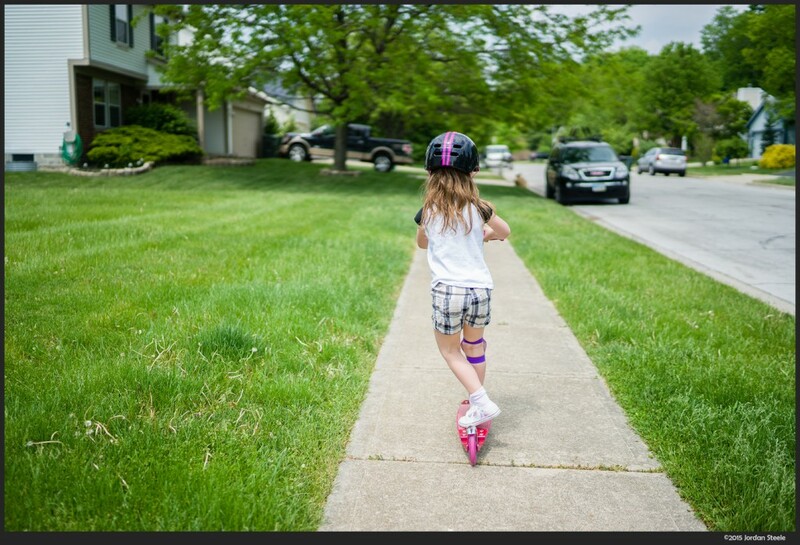 However, the ample grip on the A7 II does allow the lens to handle fairly well in the field. Balance is a bit front heavy, but when supporting with two hands, the lens feels good. It does, however, begin to wear on your wrist after a day’s shooting if you are like me and shoot your mirrorless cameras by carrying the camera and using a wrist strap. The bigger issue to size is in the added heft to your bag and the sometimes greater intimidation for your subject that can come with larger lenses. While I definitely noticed the weight and size every time I pulled the 35mm f/1.4 out of my bag, the size wasn’t as big a detriment as I originally envisioned it would be during actual shooting. Still, for those looking for a light flexible setup, you may want to look to the 35mm f/2.8 or the manual focus Zeiss Loxia 35mm f/2.0. This is not a lens you’re going to grab for a casual single lens outing. The Zeiss 35mm f/1.4 Distagon features a very fast and quiet autofocus motor capable of locking quickly onto your subject with good accuracy. Overall performance in most lighting situations was quite good, though I found the lens slowed down quite a bit in lower light and especially in backlit scenarios, where I’d sometimes get full-range hunting before finally locking on. I tested the lens for continuous autofocus using the A7 II, and the 35mm f/1.4 was able to turn in a decent performance in this area. While I can’t say that almost all the shots were in focus in this scenario, I was getting around a 50-60% hit rate at f/1.4. While not the greatest performance in the world, some of this is likely due to the A7 II’s capabilities as well. The shot above was captured in continuous focus mode at f/1.4. It’s really hard for me to comment on this, as I haven’t used the Loxia 35mm (I hope to shortly), and the Batis 25mm is not out yet. I do think the Batis 25 and the 35s are different lenses, and I wouldn’t consider them as for the same types of shooting. Between the two 35s, provided the Loxia is similar in optical quality (again, I haven’t used it), I’d lean towards that simply for size. However, if you’re after simply the best optical quality, I don’t think you can go wrong with the FE 35/1.4. I can’t imagine the Loxia would actually outperform it, and even if there was a very slight edge, you’re splitting hairs that would be essentially impossible to distinguish in a final image. This exchange is particularly helpful. One, perhaps, dumb question: Which is better for landscapes – the 25 or 35 framing? 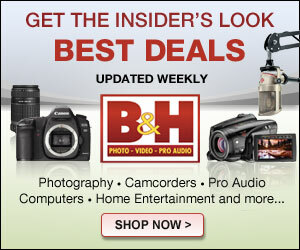 In other words, the Batis 25 or the Sony Zeiss 35? Well, it’s going to depend on the scene and your desired framing. I’ve used lenses as wide as a fisheye and as long as 300mm equivalent for landscapes. Thank their stories so well made. Thanks for the great review.your findings are almost same as mines…im using this lens for a few months and i can easily say this is the best lens i ever used (be sure used many glasses)…i just bought 2nd A7body to weld this glass on it…i also recommed 55 zeiss which is an another mind blowing glass. Thank you for taking time to test this great lens and write this informative review. I have to agree with all you wrote. For past 3 months I was jumping between CV 35/1.2, FE 35/2.8 and Loxia 35/2. I couldn’t justify keeping them all, but each one has some great advantages: CV has very unique bokeh, FE got AF and nice colors and Loxia has a great separation of subjects and nice contrast. I just got FE 35/1.4 and this is all 3 lenses in one: great bokeh, AF and nice contrast. I am still getting used to the size and weight, but so far this lens let me sell other three with no regrets! Thanks you again. I like your particular attention to details in your reviews.i always read your review last,since you are the catalyst in my decision making process on anything I buy. Pingback: Distagon T* FE 35mm F1.4 ZA ????????????? | ???????????? ?